If you ask someone what they know about the Marx Brothers, they will most likely look at you with uncertainty and confusion. In today’s world, the comedians we most recognize are late night talk show hosts like Jimmy Fallon and Stephen Colbert and purveyors of over-the-top comics such as Sacha Baron Cohen. Our comedy very likely comes from Saturday Night Live and South Park. It seems the comedy of the Marx Brothers is all but lost in the modern world of outlandish humor, but we couldn’t be more wrong in that assumption. If we look closer at the Marx Brothers, we will see how this comedic family continues to influence our entertainment, nearly 100 years after they heyday of the famous brothers. One aspect of the Marx Brothers’ comedy that makes them still relevant today is their choice of controversial topics that reflect current situations. While it may not seem like Marx Brothers’ movies and plays have a significant plot line, their stories satirize concepts like imperialism, politics and art elitism. Horse Feathers (1932) pokes fun at higher education and prohibition, while Duck Soup (1933) satirizes dictators and authoritarian governments. Even The Cocoanuts revolved around the 1920s land bust in Florida that contributed to the Great Depression, a circumstance not far off from the economic recession after the housing crisis in the early 2000s. In addition to choosing controversial plot lines, the Marx Brothers’ comedic influence can be seen in just about everything. Perhaps what makes modern audiences overlook them is that their brand of comedy cannot be clearly defined since it contains elements of multiple comedic styles including vaudeville, spontaneous gags, slapstick and musical numbers. Every subject is fair game in the Marx Brothers’ comedy, which is what makes it incredibly brilliant and memorable. Once modern audiences experience a Marx Brothers’ show, it’s hard to forget Groucho’s iconic moustache, eyebrows and cigar; Harpo’s trench coat filled with gags and his honking horn; Chico’s Tyrolean cap and curly hair; and Zeppo’s cheerful, romantic lead. With their wildly hilarious routines and tricks, it’s easy to see how their comedic styles are alive and well in modern humor. If modern audiences are tired of the same jokes and forced attempts to be humorous, the best cure for them might be seeing a Marx Brothers show. 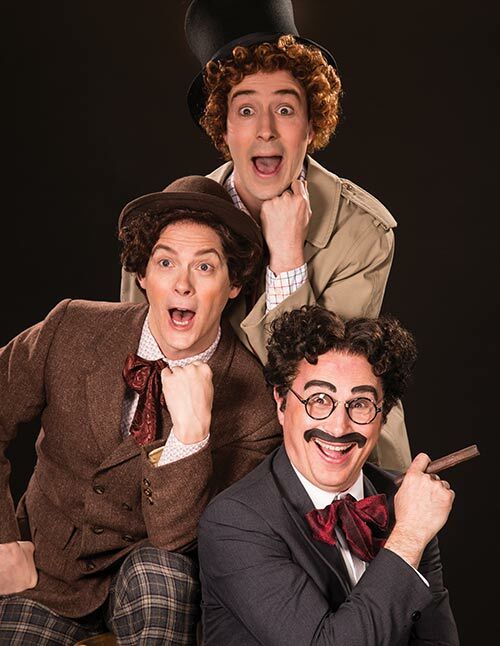 With plot lines that contain situations relevant to today, quick lines and gags and unforgettable characters, a Marx Brothers show will be the best bet to hit the refresh button on comedy. The festival’s production of The Cocoanuts runs from July 1 to October 15. Other shows in the season are Much Ado about Nothing, Henry V, The Three Musketeers, Mary Poppins, Julius Caesar, Murder for Two, and The Odd Couple. For more information visit www.bard.org or call 1-800-PLAYTIX.